Capitalism is cutting to the chase and blurring the boundaries between its most profitable annual events. They’re not just sticking to Christmas this December, since the demand for Easter eggs is so high, shops are selling them early this year! Gone is the pretence that Easter eggs are only for a strict three month period, now we can get Creme Eggs and Mini Eggs anytime! 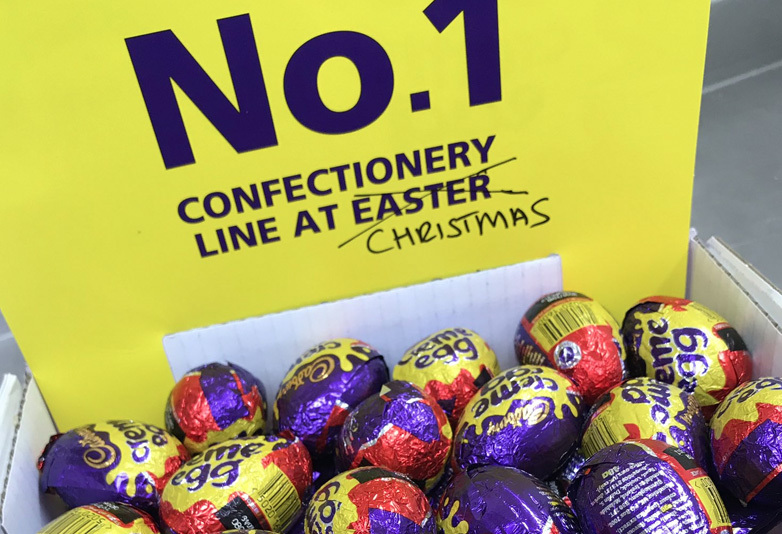 Christmas shoppers have noticed that their local sweet shops are stocking Cadbury’s Creme Eggs and Mini Eggs about five months too early. They’ve got a point, not sure how Cadbury’s thought the early eggs would fit into the Christian narrative. While shoppers seem kind of outraged at the timing of the eggs, there aren’t too many complaints as they are proving popular. Stick some string on them and they’ll pass as pretty good baubles. In fact, I’m shocked that Cadbury’s hasn’t thought of doing round creme-filled baubles to really rinse the Creme Egg hysteria that reigns on society every Easter. Very confused to find @CadburyUK Creme Eggs in the shop. Confused, but delighted! Oh god Cadbury’s creme eggs ok sale in central London ALREADY. Are they now a Christmas thing? It wasn’t just Creme Eggs on sale, it’s also mini eggs that newsagents are stocking up on. Not even December yet and shops have already got creme eggs and mini eggs out. Crazy! One Leeds newsagent has absolutely no shame in their early Easter theme, advertising their Creme Eggs on Twitter. Look what’s arrived! Why wait til Easter! Boscombe East Post Office is subverting all December expectations, saying ‘forget Christmas, Creme Eggs have arrived’. Forget Christmas… 🎄 @CadburyUK Creme Eggs have arrived!!! The American company that has bought this company have abandoned the Quaker ideals of the original company and have bastardized Cadbury’s legacy. And stop selling Easter eggs at Christmas ffs. The Sun spoke to Cadbury’s about their early Easter arrivals and they said their eggs go on sale at all major retailers on January 1. As some stores know that people can’t wait to get their hands on Easter products, they may decide to stock the product before Christmas. They also confirmed that that last year’s popular treasure hunt for the white creme egg is back again next year, with an even bigger top prize. It’s almost like big companies don’t hold public holidays sacred and will sell anything at any time as long as it brings in money. Anyway, I’m going to go and buy some Mini Eggs. Don’t bite the hand that feed you, ey?